Training and Tutorials - Is There an App for That? Five recent Truman graduates have been selected as Fulbright recipients for the 2013-2014 academic year. All of Truman’s Fulbright recipients will teach English in schools or universities. Students selected and the countries for which they received grants include: Shawn Bodden, Georgia; Clara Dahmer, Andorra; Ashley Kleiner, Taiwan; and Hope Schaeffer, South Korea. Additionally, Bethany Hoekzema, a recent MAE graduate, was named one of 12 recipients of the Fulbright/HAEF Teaching Fellowship co-sponsored by the Fulbright Program and the Hellenic American Educational Foundation. Hoekzema will teach and work in Greece. Fellows act as young ambassadors and provide a cross-cultural educational experience by infusing their culture, ideas, language and knowledge into the school’s community. The Fulbright U.S. Student Program is the largest U.S. exchange program offering opportunities for students and young professionals to undertake international graduate study, advanced research, university teaching and primary and secondary school teaching worldwide. The program currently awards approximately 1,800 grants annually in all fields of study and operates in more than 155 countries worldwide. For more information on the program, visit us.fulbrightonline.org. 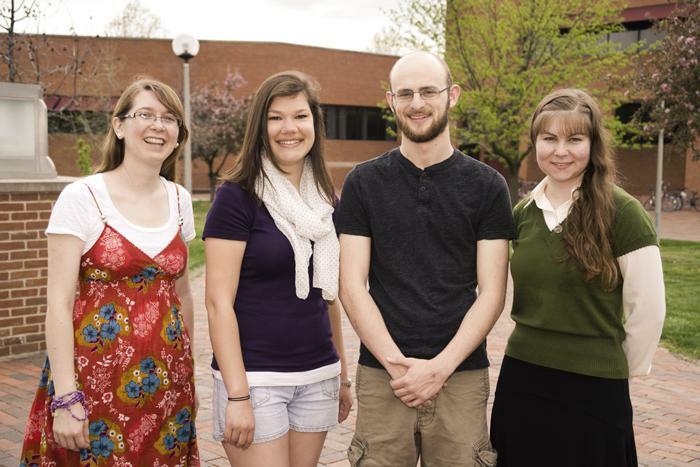 Truman Fulbright, recipients, from left to right: Ashley Kleiner, Clara Dahmer, Shawn Bodden and Hope Schaeffer. Not pictured: Bethany Hoekzema. Dr. Jacob Sentgeorge, tenor, and Kimberly Carballo, pianist, will perform a guest artist recital at 2 p.m. July 20 in Ophelia Parrish Performance Hall. The program features art and popular songs of World War I. Immediately following the performance, a master class will take place featuring Truman voice major Daniel Hansen. The public is invited to attend both events, free of charge. Sentgeorge has served as assistant professor of voice at the University of Central Missouri since 2008. He has garnered enthusiastic acclaim for his performances as a soloist with Pro Musica Colorado, the Windsor Symphony Orchestra (Ontario), the professional chamber ensemble Spire (Kansas City), the Columbia Chorale (Missouri) and Pro Musica (Kansas City). He has presented guest recitals in Annapolis, Kansas City, Bloomington, Ind., Manhattan, Kan., and West Palm Beach. He holds the Doctor of Musical Arts degree from Indiana University. Carballo is administrator of music for Indiana University Opera and Ballet Theater at the Jacobs School of Music. She has previously worked as IU Opera’s interim head coach as well as mainstage and young artists’ program coach for the Compañía Lírica Nacional de Costa Rica and instructor and vocal coach at the Conservatorio Musical de Alajuela, the Universidad de Costa Rica and the Universidad Nacional in Costa Rica. In addition to her duties at Indiana University, she maintains a private studio as a freelance coach, collaborator and piano teacher. Staff from Student Affairs, the Student Health Center, University Counseling and Disability Services will be offering a two-session training session on Mental Health First Aid. This training is designed to assist faculty and staff who may come in contact with a student having a mental health crisis. Sessions will take place from 12:30-5 p.m. July 30-31 in the Student Union Building Conference Room. Successful completion of the course requires attendance at both sessions. Additional information and program enrollment may be found at eventmanager.truman.edu/generallist.asp?department=Human+Resources. Questions concerning this event may be directed to Joe Hamilton at 660.785.4014 or hamilton@truman.edu. Chantell Johnson, who graduated this past May from Truman, will be featured on the ABC’s Extreme Makeover Weight Loss Edition from 7-9 p.m. July 30. The two-hour program will feature Johnson, whose dream was to return to Truman and complete her degree. The ABC team visited the Truman campus several times as they followed her yearlong journey and were on campus to witness her receiving her diploma. Veeve Holtz, a former Truman staff member, who now owns FKS, served as Johnson’s local personal trainer during her yearlong struggle. FKS is coordinating a watch party for all to celebrate Johnson’s reveal at 7 p.m. July 30 at Colton’s Steakhouse. For planning purposes, RSVPs are required by July 22 and can be made by emailing fksfitness@gmail.com or calling 660.851.4578. The Streamline Refinance Scholarship for Finance and Economics is now available. Details can be found at streamlinerefinance.net/finance-economics-scholarship.html. Freshman parking permits will be included in the Residence Hall check-in packet if the registration form is completed prior to Aug. 2. Late registrations, commuter parking permits and upperclassmen parking permits will be processed and distributed from the Parking Services Office, General Services Building 100, located in the Department of Public Safety at the corner of Franklin and Patterson streets. If you have questions or problems getting your parking pass, the Parking Services Office will be open Move-In day, Aug. 17, from 9 a.m. to 3 p.m. There will be expanded Parking Services Office hours 8 a.m.-4 p.m. Aug. 19-22. For more specifics about the parking rules and regulations, visit the Department of Public Safety website at police.truman.edu and click on Parking Services. For complete details on registration, tee times, hole sponsorship and more, click here. The Learning Technologies Team has consolidated a list of the best available tutorials and information guides to facilitate professional development in a wide variety of office productivity and instructional tasks. Topics range from doing a mail merge in MS Word to making a movie montage in iMovie, to sending a quick video email. Check out training.truman.edu to see the collection of resources, some created/recorded by Truman staff and others that have been collected from the Internet at large. If you cannot find a needed tutorial or you have one to suggest, contacting ITS can be accomplished through this same page. The library has a new microfilm scanner. Utilizing new scanning technology, it allows patrons to view, scan and manipulate images from microfiche, microfilm and even microcards, with options to print, email or save them to a USB drive. Student Affairs is looking for faculty and staff to volunteer to help students move in on Move-In Day, Aug. 17. Volunteers will help unload cars and carry items to rooms. To sign up, contact the Student Affairs Office at 660.785.4111 or email bkral@truman.edu. Twenty volunteers are needed to assist with the new student welcome picnic on the Mall from 5-6:30 p.m. Aug. 18. Faculty and staff members willing to volunteer should email Jacey Wood at jacey@truman.edu by Aug. 9. For more information about the picnic contact, Wood at 660.785.5404. The next issue of the Truman Today will be available online July 29. The Truman Physical Plant was able to recycle 320 mattresses for a total of 19,200 lbs. of recycled material. The mattresses were sent to and processed by LRP Recycling. Truman officially became a member of the Great Lakes Valley Conference (GLVC) July 1. TrumanBulldogs.com, will feature a sport-by-sport breakdown, running twice per week throughout the summer, to help fans become familiar with the new league and its 15 other institutions.